Why am I learning to draw? Well, life is a little complicated at the moment. I’m stuck in the middle of a house move with everything packed away in boxes, and it’s been like this since January! I really miss my watercolours and there’s no chance of digging out my studio and setting everything up while I’m staying with a good friend who’s very kindly putting me up during my transition. However, I do have pencils, paper, time, curiosity, enthusiasm and heaps of determination to continue my artistic journey , and I realised that learning to draw may fit nicely into the structure of my current circumstances, work life, and personal lifestyle. Learn to draw animals in various poses, such as horses, dogs, cats, birds, farm animals etc. Not only do I believe that given enough time and perseverance that every single one of us would be able to learn to draw anything we put our minds to, I know that if I could learn to draw properly, it would be a massive personal help to me with my ongoing Watercolour Journey. Like most of us, I’ve drawn since I was little, but I’ve never had any formal training apart from what I received at school. I also have a very good collection of Learn To Draw books, but reading drawing lessons out of books is nothing like the same experience as someone actually teaching you how to draw. With these self-training how-to books you never have the benefit of an experienced artist or tutor to assess what you are doing, critique your artwork, or give you the encouragement and guidance that’s so important to helping you develop your techniques professionally, and to a highly accredited standard. There are plenty of free online “learn to draw” classes out there on the internet, and I found there are hundreds of lessons on how to draw on Pinterest too. But I’d still have the same problem of not having an experienced artist or tutor to critique my work. A properly well-structured course, together with the encouragement and guidance of a skilled art tutor and artist to guide and help me develop my drawing skills to a professional level is of paramount importance to me. I’m currently not in a position where I can book myself into local drawing classes as I’m unsure if I’ll end up living locally to where I’m staying at the moment. The best thing for me was to see if I could find an online drawing course that matched my available budget, and fitted in with any spare time I could make available for such a course. I also wanted to see if there was anything out there that may also include modules on coloured pencils too, because it would be ideal that if I was learning to draw I might be able to transfer some of the new skills I was learning into my watercolours at the same time, plus I could probably work through any coloured pencil sections after I’d settled into my new house and set up my studio again. The Complete Online Drawing Certificate Course. It has everything I’m looking for. 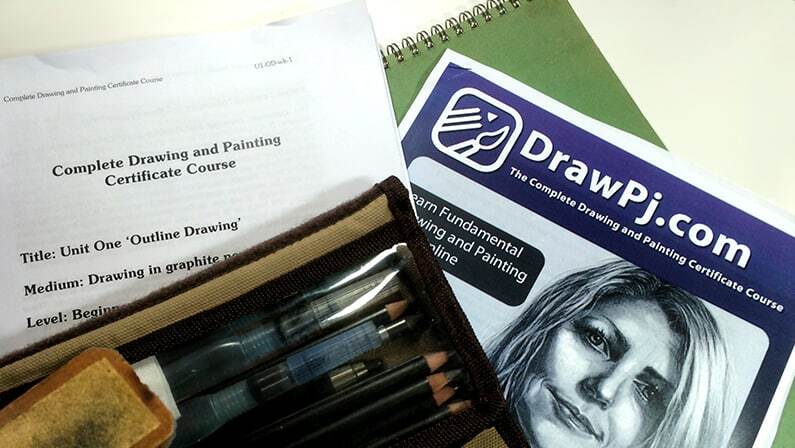 It’s well structured, it will enable me to learn the fundamental drawing techniques that Professional Artists use, includes a one-on-one personal tutor, is within my budget, and fits in very well with my busy schedule as I can even do the course in my pyjamas! – which is perfect!! I’ve signed up to take The Complete Online Drawing Certificate Course of six units which consist of a series of 37 fully printable e-books, which will take me between 2 and 4 hours per week to work through, and after 42 weeks I will have completed the course, become fully certificated, and CPD accredited.